The Pentagon’s newly empowered chief management officer would abolish offices and reshuffle numerous functions under a draft plan released on Tuesday by House Armed Services Committee Chairman Rep. Mac Thornberry, R-Texas. Two bills aimed at improving acquisition and downsizing the 28 offices in the Defense Department’s so-called “4th Estate”—its human resources, procurement, information and auditing agencies—came as the House panel embarked on drafting of the fiscal 2019 National Defense Authorization Act (H.R. 5515), beginning with the department’s requests. Savings from scaling down the back offices would, the plan suggests, benefit troops and weaponry at a time when Defense spending is rising. The bills envision a strong implementation role over the next three years by the department’s first chief management officer—a post filled this spring by John Gibson. The reforms also appear to be a response to a McKinsey & Co. study overseen by the Defense Business Board allegedly identifying $125 billion in Pentagon waste. If implemented, the Thornberry plan would save an estimated $25 billion, or 25 percent of the “4th Estate” budget, and abolish thousands of headquarters jobs, according to Capitol Hill staff. For example, it would have the chief management officer abolish the Defense Technical Information Center, the Office of Economic Adjustment, the Test Resource Management Center and the Washington Headquarters Services by transferring their functions to undetermined offices. 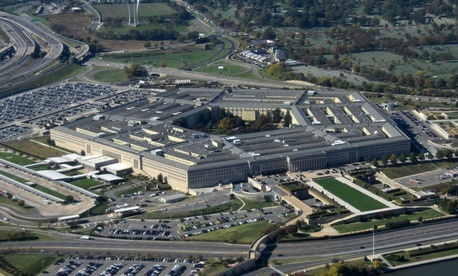 Also eliminated by January 2021: the Defense Human Resources Activity, with an undersecretary assuming responsibility for such functions as the Defense Manpower Data Center; the Defense Suicide Prevention Office; the Defense Personnel and Family Support Center; and the Sexual Assault Prevention and Response Office. By the same deadline, the Pentagon would abolish the Defense Technology Security Administration, its functions transferred to an office selected by the undersecretary for intelligence. The Defense Information Systems Agency would also be doomed, with its functions and some personnel from the Defense Information Network transferred to U.S. Cyber Command. The DoD Office of the Inspector General would be obligated, among other tasks, to reduce duplication among all department IG offices in such areas as public affairs, human resources and services contracting. But that office would also gain authority over reviews of the budgets of IGs for smaller Defense agencies.